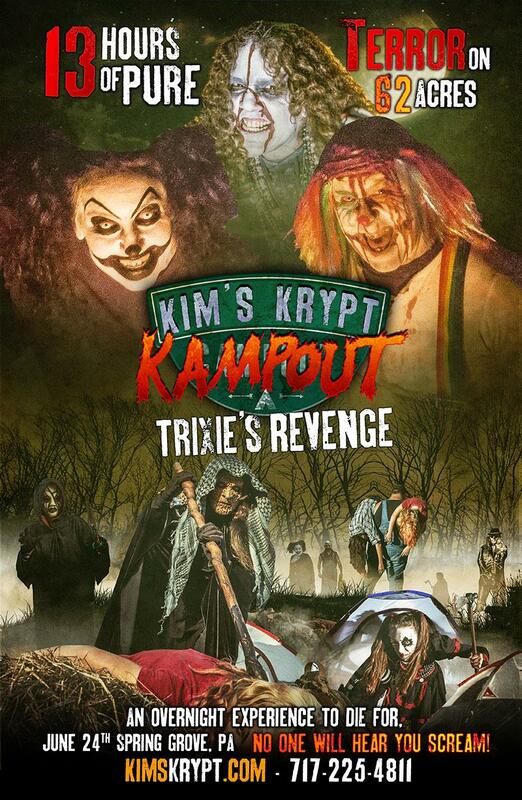 KIM’S KRYPT KAMPOUT, June 24th, 2017 – Tickets on SALE FEB 1st! This unique 13 hour overnight Kamping experience is a hands on, interactive, team oriented scavenger hunt on 62.5 acres. We provide the tents for 2, 4, up to 10 victims. 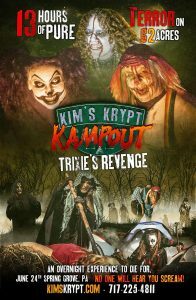 Dinner, breakfast, tea, lemonade, plus a specialty Kampout gift bag with limited edition T-shirt and other horror goodies included. Ghost stories and marshmallows by kampfire and outdoor horror movies under the moonlight. Option to stay in a Haunted House limited. Safe Tent Zone option available in case you would like to get some sleep, other than that, it’s ON all night long! Fun krazy, horror games and challenges may include blood, guts, gore, removal from tents, separation from group and intense FEAR! Cash prizes awarded to the top 3 scavenger hunt winners. 18 and over, must sign a waiver. Good luck! Don’t be left out in the woods! KimsKrypt.com WE put the F in FREAK!